Next to a home, automotive vehicles represent the largest expenditure for most consumers. Keeping those vehicles well-maintained and, when necessary, properly repaired can ensure many years of reliable service. Dealerships. The service centers of new car dealerships provide warranty service and repairs for the models the dealership sells. (Some dealerships may also service other make vehicles.) Positive reasons for choosing a dealership may include: they should be thoroughly familiar with your vehicle, they should offer factory-trained technicians, and original factory (OEM) parts are usually quickly available. Repairs under warranty must usually be performed by an authorized dealership. Most dealerships offer decent guarantees on parts and labor. On average, however, dealerships tend to charge a bit more than other types of service centers. Independent service centers. In surveys of several types of work (brake, muffler, oil change) conducted by Consumer Reports, consumers rated "best" independent service centers offering a full range of repair and maintenance services. An independent service center that offers experienced, well-trained mechanics working in an up-to-date shop, that has experience in working on your make vehicle, and that stands behind its work can deliver excellent service. Establishing a long-term relationship with a shop and mechanic that know your vehicle and take pride in their work can prove ideal. But the category of independent service shops also provides cover for the fly-by-night, incompetent and dishonest operators. Specialty shops. Specialty service centers are those that focus on one aspect of automotive service, such as brakes, mufflers, transmissions, oil changes, and the like. Some are regional or national chains and others are independent. Many consumers find such specialized service convenient and reliable. Others like the "lifetime guarantees" that seem to be a common stock-in-trade of such chains. Several cautions apply, however: Consumers should be sure that technicians are trained and certified. Beware of shops that try to sell services or repairs that the vehicle doesn't need or that are outside their specialty. Read the small print on the "lifetime guarantee"—in many instances, it covers only the part(s) and the consumer must pay for labor each time the part (which may be of lower quality) needs replacing. Using the following tips to check out any type of service center can help you select a shop qualified to meet your needs. Start with recommendations. Ask friends, neighbors, and coworkers for recommendations of service centers at which they've gotten good service. Ask them why they felt it was satisfactory, what they liked best about the shop and service technicians. You might also look at web sites that rate service centers or provide a consumer forum (enter "evaluating auto service centers" in your search engine), although we remind you to use commonsense when judging the usefulness of the site. Before paying a visit to any recommended shop you like, check it out with the local Better Business Bureau and with local and state consumer affairs agencies. Select shops that are properly licensed and have well-trained experienced technicians. Don't choose a shop just because it's the most convenient. The quality of the technicians that work on your car generally determine the quality of the repair. Look for ASE certification (from the National Institute for Automotive Service Excellence), indication that the shop offers "AAA Approved Auto Repair" or other evidence of training. Ask if the shop has experience working on your make and model vehicle. Determine if they are familiar with the type service or repair you need. Check the shop out in person before you need it. If a service center passes your initial checks, visit it. Make an appointment for some minor maintenance service, such as an oil change, if you like. Does your experience provide satisfactory answers to the following questions? Is the shop clean and orderly, particularly in the service bay areas? Fancy isn't important, but professional is. Is the service manager or intake person courteous and willing to answer questions and otherwise communicate well with you as the customer? Does the service center have written policies about how labor is charged, about refunds, and about warranties, guarantees and "comebacks"? Does the service center provide written estimates? Do they explain their diagnosis fully and allow you to talk with the technician if you request it? Does the service center provide an itemized bill and return used, replaced parts to the customer if requested? Don't hesitate to ask the service manager or mechanic any questions or to communicate any concerns you have during the repair process. A repair shop that cares about its customers will keep those customers informed as necessary during the repair. If unexpected problems are uncovered during the routine maintenance or contracted repair, the service personnel will explain fully, be happy to answer questions and will work with you to find solutions. If the nature of the problem is unclear, a good shop will fully explain the diagnostic process, the probability of the potential problems, and the options for addressing those problems. If you are unsatisfied with how the shop handles any of these aspects, look for another service center. A good service center stands behind their work. In addition to having a written policy for the warranty on their repairs, a good service center will request that you bring the vehicle right back if the diagnosed repair did not correct the problem. They will happily work to pursue the problem further and get the job finished. We could also call this article "How to Work with Your Mechanic." Consumer Affairs agencies across the country get more complaints about poor auto repair service than almost any other area. Repair services and the skills of mechanics can vary widely. 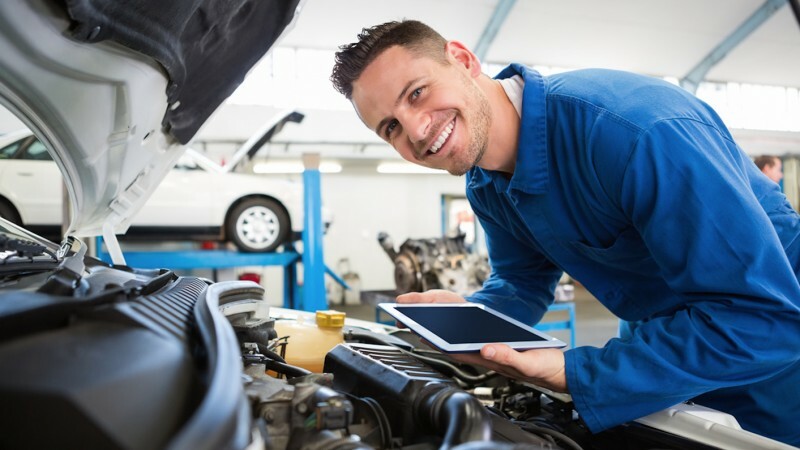 But in addition to selecting a service center wisely, using these ten tips can help you get satisfactory results working with automotive service centers and technicians. Educate yourself about your vehicle. At the very minimum, read the owner's manual; familiarize yourself with the vehicle's basic equipment and the manufacturer's recommended maintenance schedules. Learning the functions of the vehicle's basic systems or parts is also a good idea. For example, knowing the basic functions of the battery, starter and alternator, or the components of the "drivetrain" or the basic type steering, suspension and braking systems of the vehicle better enables an owner to understand maintenance and potential diagnoses of problems with these systems. Practice the basics of good auto maintenance. Many car owners could avoid unexpected breakdowns and costly repairs by following the maintenance schedule recommended by the vehicle manufacturer and by regularly checking the vehicle's "vital signs." Doing these little chores helps you learn about the vehicle, too. Every time you gas up: Check oil and coolant levels and tire pressure. As recommended: change oil and filters; balance and rotate tires; service radiator/coolant; service brakes. Check tread on tires every two months. Pay attention to the vehicle's performance. Sound, feel, smell and sight can all give vital clues to emerging problems. For example, checking out that high-pitched whine the engine has started making, the slight clicking as the wheels rotate, the slight vibration between 50 and 65 mph, the slight burning smell or smell of hot coolant, a temperature gauge that's running just a little hotter than normal—to name just a few common symptoms—can help you catch and correct a minor problem before they grow. Fix little problems before they get to be big problems. Taking a vehicle in at the first minor signs of trouble can result in easier diagnosis, quicker fix, money saved, and prevention of larger problems. Be specific about the symptoms the ailing vehicle is exhibiting. Who knows a vehicle best? The driver. So, when your vehicle suddenly starts making unusual noises or behaving strangely, describe what you hear, smell, feel, or see as specifically as possible. For instance, is the sound a rhythmic "swish, swish" coming from the right front or an irregular hollow clunking sound coming from the rear? Does any strange behavior accompany the sound? When does it happen? How long has it been going on? Does it happen in some situations and not others? Write the symptoms down to take to the service center. Go over these symptoms carefully with the service manager or the mechanic. Ask them to drive with you if that would help you point out a vague problem more clearly. Don't offer your diagnosis or guess to the service center. After you describe your vehicle's symptoms, let the service center make the diagnosis. If your car is hesitating for three minutes on startup, just describe that. Don't say, "It must be the fuel injectors." If the transmission is slipping, don't say, "I guess I need a new transmission." Voicing your own idea about what's wrong may mislead even a good shop or tempt a less scrupulous shop to sell you something you don't need. Ask for a diagnosis and estimate in writing before you authorize the repairs. After you've worked with a mechanic or shop for a long period of satisfactory service, a verbal diagnosis and estimate and authorization over the phone may be fine. But a written estimate protects both owner and mechanic. Don't be intimidated. Ask questions. If the diagnosis doesn't make sense, ask questions courteously. Ask for an explanation you can understand. Good shops are happy to explain what's wrong and to present options for repairing it to a customer. Informed customers are usually happy customers. Good shops will also tell you if more extensive diagnostic tests are needed to identify the problem and what the options and costs are. If anything about the shop makes you uncomfortable, don't hesitate to take your vehicle to another shop. Perhaps, the diagnosis doesn't seem quite right, the staff members don't have time to answer your questions, or the cost seems excessive. Even if you have to pay a diagnostic fee to the first shop, it's okay to get a second opinion on a large repair or on any recommended repair that has not been explained to your satisfaction. After the repair, you should receive a written record of the work done. The shop should explain exactly what work was performed, return the old parts if you requested them when you authorized the repair, and present a detailed bill or invoice for your records. A good center will also have a written policy about warranties, refunds, and "come-backs" (how they respond when you come back immediately because the symptom/problem you observed has not been fixed or recurs within a few days). A Bonus Tip: If the service was excellent, say so—to the shop and to your friends. Everyone likes to be praised for good work. If the service center and particular personnel there gave you good service, tell them so. If they went out of their way to help, write a letter for the bulletin board. Recommend the shop to friends and tell them to say you sent them. CarCare.org, the website of the Car Care Council, offers a variety of information for maintaining and caring for your vehicles. Remember that old saying, "A stitch in time saves nine?" It doesn't apply just to clothes. Taking a few minutes regularly to perform some simple maintenance, can keep your car or truck looking and running like new for years. Here's a quick checklist. Check the vehicle's "vital signs" every time you gas up. When you fill the gas tank, pop the hood and check the levels of oil, coolant, brake fluid, and power steering fluid. You'll need a paper towel for the oil; most of the others can be checked at a glance in most vehicles. If the vehicle has windshield washer fluid, check that level also. Check tires for proper inflation every two weeks. Underinflated tires are a leading cause of blow-outs and accidents. The National Highway Traffic Safety Administration has found that 12% of passenger vehicles on the highway have at least one underinflated tire by at least 25%. Get a tire gauge—they are inexpensive—and use it when you gas up or at least once every two weeks. The proper inflation level for your tires is in the owner's manual and on the driver's side door jamb or the backside of the gas filler door; it is not on the side of the tire (that's the maximum allowable pressure). If you fear getting your hands dirty, keep a container of wet towelettes under the seat or in the glove compartment. Some experts recommend washing the car weekly. You may not need to do it that frequently, but keeping the exterior free of dirt, road salts, tree sap, bird droppings and the like can keep your vehicle looking like new, enhancing its value. Be sure to wash road salts off quickly even if you have undercoating to help prevent rust. Wax the vehicle about twice a year (or whenever the water quits beading up on the surface). Touch up nicks and scratches with matching paint before they provide an entryway for rust. Scotchguarding the interior upholstery or treating leather and cleaning the interior frequently is also a good idea. Follow the recommended schedule for oil changes. Oil is an engine's single most important safeguard against wear and tear. Changing the oil and filter regularly, therefore, is the single most important thing you can do to keep your engine healthy. Manufacturers of many new vehicles may recommend an oil change only every 7,500 miles or longer instead of the time-honored "3 months or 3,000 miles." Following the manufacturer's recommendation will certainly keep your car within warranty, but many mechanics still recommend changing the oil more frequently because they say that most driving (in-town, stop-and-start, in traffic, in high heat and extreme cold) meets most manufacturers' definitions of "severe driving conditions." Check your manual to see which criteria your driving patterns fall under. You may decide the dollars spent changing your oil a little more frequently than the manufacturer recommends is worthwhile insurance. In any case, don't put the oil change off longer than the manufacturer recommends. Check tire tread every two months; balance, rotate and align tires as recommended. These steps can help insure that you get the longest, safest service out of your tires. Tires need replacing when the wear bars begin to show or when you can see the top of Lincoln's head when you insert a penny head first into the tread (about 2/32" or less). Check hoses and belts every month. Belts should be adequately tight. Hoses should be firm and not spongy. If you are unsure how to check, ask the attendant at a full-service gas station or your mechanic to demonstrate the techniques to you. Because modern belts and hoses don't show visible wear much, it's also a good idea to keep a record of when new belts and hoses are installed and then replace them at intervals recommended by the vehicle's or belt/hose manufacturer. The general service period is three to four years. Caution: don't test a hot hose with your bare hand. Every fall and spring, check coolant strength. The proper strength coolant mixture keeps the vehicle's coolant system from freezing in winter or running hot in summer. Adopt a regular check schedule that fits your climate. Have a service center flush and refill your cooling system at intervals recommended by the vehicle's manufacturer. Check brakes for wear at least once a year. Regular brake maintenance means you don't leave stopping safely to chance. Don't wait until you hear grinding or squealing sounds or until the brake pedal starts to fade or feel spongy to have the brakes checked. Check battery connections regularly and keep track of the battery's age. Also keep those jumper cables in the trunk. Checking that connections are secure and that no corrosion has built up on battery terminals can help prevent those annoying mornings when the car won't start. Batteries are also rated to give a certain time period of service. Keep track of when yours is due to be replaced. Follow the manufacturer's recommended maintenance schedule for all systems. Taking your vehicle in for the "minor" and "major" service required by the manufacturer to keep the vehicle under warranty is a must. Most manufacturers also make service recommendations for periods beyond the warranty. Use these as a minimum guide. For more information on good vehicle maintenance: The Car Care Council provides an extensive library. Consumers buying a new or used vehicle at most dealerships will face pressure to purchase an "extended warranty" on that vehicle. Extended warranties are also known as "service contracts." Dealerships like to sell extended warranties because they make good profits for the dealership. But do they make sense for you? And how do you use one, if you already purchased it? What Are "Automotive Extended Warranties"? In simple terms, they are service contracts with a warranty company that agrees to provide, under certain conditions, certain repair services for a certain period of time from an identified provider. As you might assume from the very general terms of this definition, the provisions and quality of extended warranties can vary greatly. Some are provided by national manufacturers or companies who stand behind their agreement; others are provided by fly-by-night companies based in states with weak consumer protection laws—companies that often take the money and fold before any consumers can make many claims against their "warranty." As a consequence, consumers must examine any contract carefully and look at all the pros and cons for their individual situation. When Does Buying a Service Contract Make Economic Sense? The average service contract costs the dealership very little but they frequently sell for thousands of dollars. Unless you are absolutely sure that you are going to keep a new vehicle for years beyond the manufacturer's warranty—and manufacturers' warranty terms are getting longer—then extended service contracts don't make financial sense for most people. Many extended warranty terms, for example, overlap with manufacturer's warranties but the consumer can't make a claim against them until the manufacturer's warranty expires. So you might think that you've bought a six-year service contract, but the policy doesn't kick in until the manufacturer's warranty runs for 5 years or 50,000 miles. In effect, you've paid big bucks for a one- or two-year contract. Some service contracts also cover only limited repairs. If you are buying a used vehicle that is no longer under the manufacturer's warranty, then a service contract may be more useful. But just as with a new vehicle, you must check out the terms and benefits just as you would for a new vehicle. Give any service contract you are considering a very close inspection, read all the fine print, ask questions, and if you don't get satisfactory answers, don't buy it. Also negotiate the price. Then check our warranty products for competitive rates. Making sure a service contract meets the following criteria won't guarantee that you, the consumer, won't get burned, but it can help. Is the service contract provided by a national automotive manufacturer or a reputable national company? How long has the company been in business? What's their record of customer satisfaction? Does the coverage term of the service contract begin after the manufacturer's warranty (or any dealership warranty on a used car) has expired? If it overlaps, does the contract provide "wrap-around" coverage, which means that the contract covers repairs not covered by the manufacturer's warranty? What are the actual years of coverage (those years after manufacturer's warranty ends) for which this service contract will be the only coverage? Can you see a sample copy of the contract before you buy it? If you can't have a sample copy for review, think twice about considering that contract. What services and repairs are covered under the terms of the contract? Does the warranty provide bumper-to-bumper coverage of both wear-and-tear and mechanical breakdown problems? Or does it cover just certain systems or parts? Or cover just mechanical breakdowns, not wear-and-tear failures? Experts advise that it's in the consumer's best interest that service contracts cover damage caused by overheating as well. Does the contract require a deductible? How much? Is the deductible required "per visit" or "per repair"? What entity under the contract provides the service for the vehicle under contract? Some contracts may require that the vehicle be serviced by a single service center, even if the breakdown occurred five hundred miles away. Better contracts allow the repair to be performed by any licensed, ASE-certified mechanic. How is a claim or request for service made under contract? Must you get the contract administrator's okay before the repairs are begun? How quickly can you contact the contract administrator if that's the case? How quickly do they respond? Does the service contract company (administrator) pay for the repair claims or does the consumer pay and get reimbursed? Avoid contracts that follow the reimbursement plan; it's too easy for the administrator to deny the claim. Does the service contract company have a "claims reserve account" with a separate insurer to cover consumers with contracts should the company fail? If the company is insured by a separate entity, what is its insurance rating? What are written policies on handling disputes over what repairs are covered and about handling problems with repairs made under the service contract? Is the service contract transferable, if you sell the vehicle before the contract expires? What's the warranty company's record with local and state consumer protection agencies, state attorney general's office or the Better Business Bureau? Make sure that you fully understand the requirements under the contract. Ideally you did this before you bought the contract, but if not, do it as soon as possible. Most contracts require that you follow the manufacturer's or their routine maintenance schedule. It is also a safe practice not to drive the car after a problem occurs but have it attended to as quickly as possible. Running a car that is overheating, for example, is grounds for voiding most service contracts. If you have to call the contract administrator for a ruling on whether the proposed repair is covered under the service contract, keep the phone numbers and other information you need with the vehicle in a handy spot.